The Motor Cycle Industry Association (MCI) has announced the winner of its special award that recognises road safety initiatives, in the field of motorcycling. 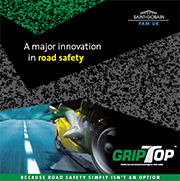 ‘Grip Top’ has been selected as the winner of the Motor Cycle Industry Sponsored award . The creators of ‘Grip Top’ have developed a new service cover that offers levels of grip comparable to other road surroundings and which is also capable of durable performance under intense traffic over a decade. Two-wheeled vehicles, such as motorcycles, scooters and bicycles are particularly vulnerable to loss of control. This typically arises from sudden changes of available grip, especially while cornering or braking, or insufficient grip in high demand situations such as sudden braking or swerving to avoid collision. The adoption of ‘Grip-Top’ in high risk situations such as bends, roundabouts, traffic lights and other areas where bikers and cyclists typically lose control and become casualties would reduce risk in such danger zones, offsetting the relative disadvantage faced by two-wheelers who cannot access many vehicle-based safety systems available to users of larger vehicles. ‘Grip Top’ was chosen for the MCI award as it has the potential to be used all over the UK and has benefits for all road users but particularly motorcycles. The industry urges other councils to follow Bristol’s example and use Grip Top whenever possible. It is important that we generate good PR and product awareness to encourage others to use this product where it is needed to help reduce accidents and save lives. Karen Cooke, MCI’s Director of Safety said, “ This year we are delighted with the range and number of nominees for the coveted road-safety awards. There is an increasing number of inventive and pioneering schemes and products with the important goal of improving road safety for motorcyclists. Across the country, there have been other high quality safety initiatives that have received a Prince Michael award for their regional contribution to enhanced road safety for motorcyclists and scooter riders. Durham County Council and Durham Constabulary’s Bikewise programme covers all ages of riders from 6 years upwards . The scheme features a very active ACU approved mini-moto scheme for youngsters , an excellent post test training scheme for those aged 17 and over as well as a special ‘ladies’ course to help improve the confidence and skills of female riders. Durham County Council use innovative engineering solutions to make roads as biker friendly as possible, using approved barriers and lighting columns as well as trialling new products such as Bike Mate which protects riders if they are unfortunate enough to collide with a lamp post for example. Staffordshire has many different approaches to improve riders safety as they are aware that a one size fits all approach to riders will not work. SCC RSU developed their own BikeSense post-test training scheme but also offer subsidies for those wishing to take IAM or ROSPA courses. Their ‘Ride It Right’ scheme introduced signs, warning riders of the hazardous nature of the roads, backed up by leaflets and other promotional activity. This scheme saw a 35% reduction in casualties on these signed roads in the first year and a further 5% the second year. In 2008 on new higher priority routes a reduction on 53% was achieved. “Around the Corner” is an innovative website offering loads of advice and information to riders in the area and those wishing to visit. Fold out maps support the website and way markers show dedicated biker routes. The local police are also keen participants offering help and advice to riders.